This article is about the city of Chaska, Minnesota. For other uses of the word Chaska, see Chaska (disambiguation). Guardian Angels Catholic Church in Chaska, built with the characteristic yellow Chaska brick. Chaska's history reflects the influence of the Native American culture. The first inhabitants are believed to be the Mound Builders, whose ancient communities are marked by mounds in City Square. Later, the Dakota (commonly known as the Sioux) were the primary nation in this region known as the Big Woods. Although the Indian mounds located in Chaska City Square indicate the immediate area was inhabited years before 1769, that's the year Chaska's recorded history began. In 1776, Jonathan Carver explored the lands along the Minnesota River and chronicled his journeys. French Canadian fur traders traveled the waterways, trading with the Dakota in the early 19th century. During this time, Jean-Baptiste Faribault established a trading post in Chaska. In 1851, the Treaty of Traverse des Sioux officially opened Little Rapids, as Chaska was then known, to settlement. Soon after, speculators moved into the new territory. Among the earliest was Thomas Andrew Holmes who, in August 1851, claimed a 20-acre (81,000 m2) clearing as the Chaska townsite. The name "Chaska" is derived from a Dakota word often given as a name to the first born male child. Records show that David L. Fuller purchased the "Shaska" townsite from Holmes in 1852. In 1857, the townsite was platted by the Shaska Company. In the same year, construction began on the original Carver County Courthouse located where the post office and KleinBank now stand in downtown Chaska. Chaska was incorporated as a village in 1871 and, by special legislative charter, as a city in 1891. An abundance of high quality clay led to the start of brick making in 1857. By the 1880s, as a result of the clay resources, Chaska was a thriving brick manufacturing center. Bricks were shipped by boat to Saint Paul and, although the city grew as a result of steamboat trade, it was not until the Minneapolis and St. Louis Railway was built through town in 1873 that rapid expansion began. With the advent of the 20th century came other industries, including the processing of beet sugar and other agricultural products; flour making, butter making, the canning of peas, corn, and tomatoes, and the curing of sauerkraut and pickles. National polls named Chaska the eighth-best city in the United States in 2007 and 20th best in 2009. In September, 2016, Chaska hosted the Ryder Cup at Hazeltine National Golf Course. According to the United States Census Bureau, the city has a total area of 17.77 square miles (46.02 km2), of which, 16.97 square miles (43.95 km2) is land and 0.80 square miles (2.07 km2) is water. The downtown portion of Chaska lies on the Minnesota River. Chaska Boulevard (Old Highway 212), Pioneer Trail, U.S. Highway 212, and Minnesota State Highway 41 are four of the main routes in Chaska. Throughout the first half of the 20th century, Chaska's population averaged about 2,000 and the nature of the city remained unchanged. The city retained its small town image until the 1950s when the transition to a metropolitan community began. The expansion of the seven county metropolitan area reached Chaska in the 1960s. With that expansion came the introduction of the Jonathan New Town design concept in 1966. The Jonathan "new town" development within Chaska brought new land, new jobs and new people to the community. This period of transition and expansion continues today. Dozens of modern industries have located to Chaska and continue to do so; residential construction adds 300 to 400 new homes per year; commercial business continues to expand offering a variety of retail and service opportunities to its residents; redevelopment of commercial areas in the downtown began in the 1980s and still continues. Although the community has seen much growth, development regulations and sound planning have ensured Chaska's small sense of community and the preservation of its rich heritage. In early 2005, the city of Chaska annexed the remaining portion of Chaska Township. Current plans for the area include a 600-acre (2.4 km2) residential "smart growth"-styled development. A new spike in the population is expected after the construction of the Highway 212 freeway passing through the heart of Chaska, serving as a fast, direct, link to the heart of the Twin Cities. This freeway will include a bus rapid transit route serving Chaska with fast, efficient mass transit, along with convenient access to the Light Rail system which will soon connect the southwest suburbs to the Twin Cities of Minneapolis and St Paul. As of 2000 the median income for a household in the city was $60,325, and the median income for a family was $69,612. Males had a median income of $45,401 versus $32,312 for females. The per capita income for the city was $25,368. About 3.4% of families and 4.7% of the population were below the poverty line, including 5.9% of those under age 18 and 6.4% of those age 65 or over. As of the census of 2010, there were 23,770 people, 8,816 households, and 6,188 families residing in the city. The population density was 1,400.7 inhabitants per square mile (540.8/km2). There were 9,290 housing units at an average density of 547.4 per square mile (211.4/km2). The racial makeup of the city was 88.1% White, 2.5% African American, 0.4% Native American, 3.7% Asian, 3.4% from other races, and 2.0% from two or more races. Hispanic or Latino of any race were 8.5% of the population. There were 8,816 households of which 41.9% had children under the age of 18 living with them, 54.6% were married couples living together, 11.1% had a female householder with no husband present, 4.5% had a male householder with no wife present, and 29.8% were non-families. 23.9% of all households were made up of individuals and 6% had someone living alone who was 65 years of age or older. The average household size was 2.68 and the average family size was 3.22. The median age in the city was 33.8 years. 30% of residents were under the age of 18; 6.9% were between the ages of 18 and 24; 30.8% were from 25 to 44; 25.7% were from 45 to 64; and 6.6% were 65 years of age or older. The gender makeup of the city was 49.8% male and 50.2% female. Since 2003, the city government has offered low-cost, high-speed wireless internet service for residents, businesses, and government entities throughout the community. Chaska is the home of numerous industrial and manufacturing concerns. Among them are TPI Specialties, Update Ltd, Wigen Water Technologies, Beckman Coulter and Hartman Homes. Over the years, Chaska has also been the birthplace of several well known products and companies, including Softsoap and NordicTrack. Chaska City Hall on City Hall Plaza. Chaska is governed through a city council/city administrator system. The council consists of four council members, each representing the residents of a ward that contains approximately 25% of the population of the community, and a mayor who is elected at large. Each council member serves a four-year term, while the mayor is elected for a two-year term. The city council formulates city policy and the city administrator and staff are responsible for city administration. In 2015, the mayor was Mark Windschitl, and the council members were: Paula Geisler (Ward I), Greg Boe (Ward II), Chris Schulz (Ward III), and Jay Rohe (Ward IV). Children attend Eastern Carver County School District (public). The school district used to be called District 112, but the name was changed when the district expanded. The elementary schools are La Academia Bilingual School, Jonathan Elementary, Clover Ridge Elementary, and Chaska Elementary. Middle schools endorsed by District 112 are Pioneer Ridge Middle School, and Chaska Middle School East and Chaska Middle School West. Chaska High School and Chanhassen High School are the two of the city's three high schools. The other is Southwest Christian High School which is a private high school. 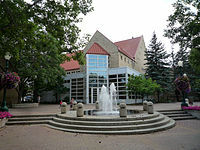 Several private institutions are in town including St. John's Lutheran Church and School, and Guardian Angels Catholic School located in the downtown area. In the 1996 film Fargo, written by Minnesota's own Joel and Ethan Coen, Chaska was featured in two of the supporting characters, real life Tony Denman (who played Scotty Lundegaard), a Chanhassen native, attended Chaska High School, and a young prostitute (played by Larissa Kokernot) who claimed not only to have serviced Carl Showalter (played by Steve Buscemi), but also to be from Chaska, Minnesota. Chaska was also featured in the film Drop Dead Gorgeous. The scene in the furniture store takes place at the old Schniedermen's Furniture store in downtown Chaska. The building has since become a fitness center. Hank Snow refers to Chaska in his popular song "I've Been Everywhere" as a place he has visited. Cheryl Strayed briefly lived in Chaska during her early life, and mentions so in her popular book Wild: From Lost to Found on the Pacific Crest Trail. Chaska is also home of the "World's Largest" 3D printed "Mustache". Found at 516 N Pine St. in downtown Chaska, the mustache is nearly 12 feet wide, and took over 300 hours to print. Phillip Bartlett, actor, voice of Mewtwo on Pokémon. ^ "City of Chaska Minnesota Minnesota". City of Chaska Minnesota Minnesota. Retrieved October 4, 2012. ^ "2010 Census Redistricting Data (Public Law 94-171) Summary File". American FactFinder. United States Census Bureau. Archived from the original on 21 July 2011. Retrieved 27 April 2011. ^ "Profile for Chaska, Minnesota, MN". ePodunk. Retrieved October 4, 2012. ^ "MONEY Magazine: Best places to live 2007: Top 100". CNN. ^ "Best Place to Live:Top 100". CNN/Money Magazine. 2009. Retrieved 2009-10-16. ^ United States Census Bureau. "Census of Population and Housing". Archived from the original on May 12, 2015. Retrieved June 9, 2014. Wikimedia Commons has media related to Chaska, Minnesota.